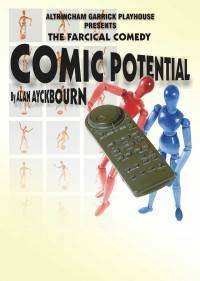 We are pleased to be able to present this latest release by the master of comedy, Alan Ayckbourn. Comic Potential shows he is on form again to amuse and divert. The setting is a third-rate TV studio churning out low budget daytime soaps. The difference is that the time is the foreseeable future and cheap actors in the form of programmable “actoids” provide the drama. But human nature will out with a result that will hurt with the sheer exuberance of its unexpectedness.